It is widely recognised that Aleksander Czekanowski (Chekanovsky) discovered the Siberian Traps during his expeditions to northern and eastern Siberia in the 1870’s. 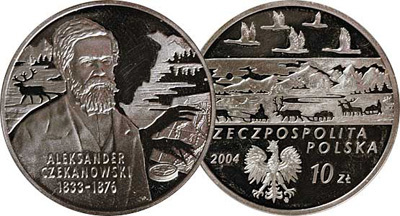 Czekanowski was born in Krzemieniec in Poland in 1833. He studied natural sciences, especially geology, at the University of Kiev. In 1863 he was implicated in the Polish Uprising and was exiled to Siberia. Despite the harsh conditions he maintained his interest in geology, and moved to the Irkutsk region, from where he led several major expeditions into remote areas of Siberia, including an expedition into the Tunguska region. For his contributions to Russian geology, in 1870 Czekanowski was awarded the Gold Medal of the Royal Geographical Society. In March 1876 he was allowed to move to and live in St Petersburg, working as a museum curator. After being allowed a brief visit to his family in Poland, shortly after his return to Russia he became ill and died in September 1876. Czekanowski has a Russian mountain range named after him, and is lauded as a famous scientist in his country of birth. 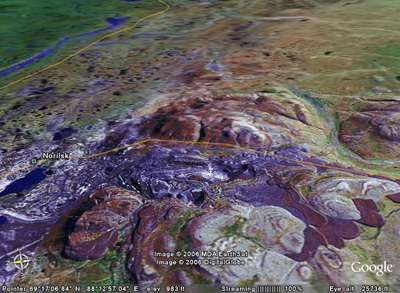 The history of the discovery of the Traps is inextricably linked to the development of Noril’sk and its ore deposits. The ores were probably worked by ancient tribes, and there was active smelting in the 16th and 17th centuries in the Mangasei settlement on the Taz River (Kunilov, 1994). The first systematic study of the deposits was begun in 1919 by Nikolai Urvantsev. The Noril’sk 1 deposit was discovered in 1926, and a railway to Dudinka, the main outlet port on the Yenisei River, was begun in 1935. The first nickel was produced in 1942, and the copper plant completed in 1949. Noril’sk settlement was founded in 1921, and is now the northernmost city on Earth with a population of over 100,000. The nickel deposits of Norilsk-Talnakh are the largest-known nickel-copper-palladium deposits. Geochemical studies of the Traps have, not surprisingly, focussed on the thick sequences of lavas and intrusives in the Noril'sk district, where there are extensive sample collections from borehole and outcrop (e.g. Lightfoot et al., 1990, 1993; Wooden et al., 1992, 1993; Hawkesworth et al., 1995). Detailed reviews have been published by Fedorenko et al. (1994, 1996) and Sharma (1997). There are, in addition, large numbers of studies published solely in the Russian literature, dealing with petrography, mineralogy, and geochemistry of the Traps from more widespread areas. We plan to provide more details of these later.